Sometimes referred to as hanging files, suspension files are a convenient drawer-based (and rack or trolley) filing system for the storage and easy access of documents. Suspension files consist of a folder suspended from two parallel runners by hooks protruding horizontally from the top corners of each file. Several files can then be hung on rails within within your pedestal drawer, filing cabinet etc. Tabs with inserts can be attached to the top of each file to denote its contents. Different suspension files have varying capacities. The most popular standard files (with a V-bottom) have a capacity of 15mm of documents per file. If you have overloaded or over-crowded files you should consider the larger capacity square bottom files with either a 30mm or 50mm gusset. In Australia, the majority of business filing cabinets, pedestals and drawers take foolscap (FC) size files. The IKEA® brand and other European manufactured file drawers typically require the smaller A4 size files. Files move smoothly in your cabinet with nylon runners. Sturdy 200gm board stays firm with constant use. 100 sheet capacity. Contrast colour makes paper placement inside the file easier. Foolscap size available in packs of 10 Files. Each pack also includes a 3M™ dry erase pen, 3M™ filing tabs and paper inserts. Australian made from 100% recycled board and 100% recyclable. Foolscap size files available with or without tabs & inserts. A4 size files available with or without tabs & inserts. Pack of 25 Foolscap size files complete with tabs & inserts. 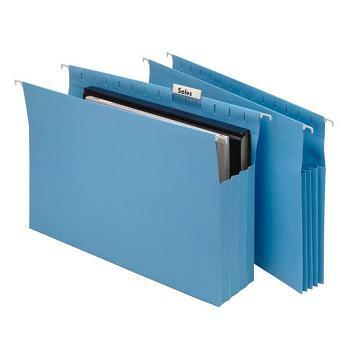 Ideal for those bulky filing jobs - brochures, bound documents, videos, catalogues etc. Double-capacity files feature a reinforced, 30mm wide base for extra-bulky filing (300 sheets of paper or 1kg content weight). 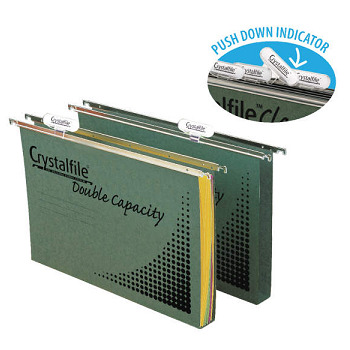 Box of 50 Double Capacity Foolscap files only - tabs & inserts sold separately. 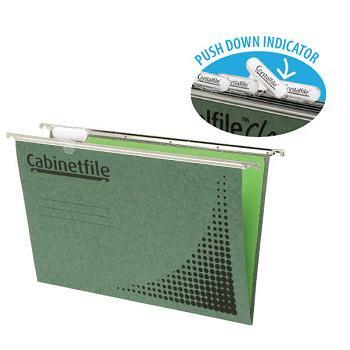 Cabinetfiles do not include float action nylon runners. 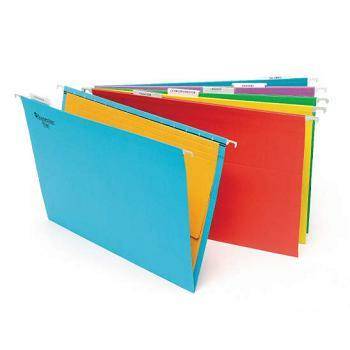 Box of 50 Foolscap files available with or without tabs & inserts. Made of durable, 100% recycled green manilla board. 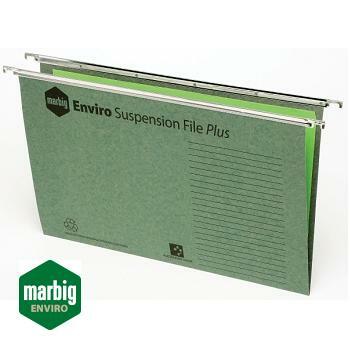 Traditional green colour files with sturdy steel suspension bars and nylon runners. Data panel on front of files for easy labelling of files contents. Board is 100% recyclable after use. Box of 50 Foolscap files including tabs & inserts. Extra wide expanding base holds more than standard suspension files. Made from strong blue manilla stock for large filing capacity up to 90mm. Closed sides extend to over 16cm to ensure your documents are stored securely. Box of 20 Foolscap files complete with tabs & inserts. Use colour to file by subject, name or project. You'll file faster — with no misfiles. Plastic coated runners for smooth, quiet filing and fixed tab notches for easy labelling. Strong manilla stock withstands constant use. 100% recyclable after use. 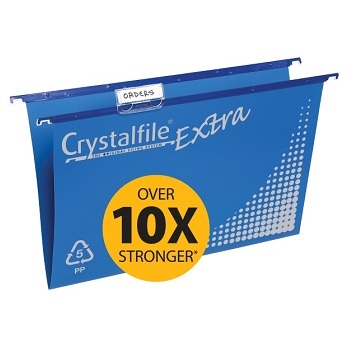 Crystalfile Extra is made from 100% recyclable, environmentally friendly polypropylene (PP) for strength and will not tear for longer lasting, durable files referred to frequently. Pack of 20 Foolscap size files complete with tabs & inserts. Blue. 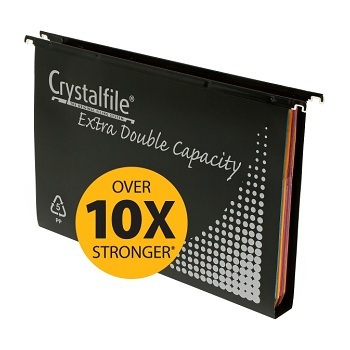 Extra tough, with an extra wide base for frequent use... Over 10 x stronger than manilla. 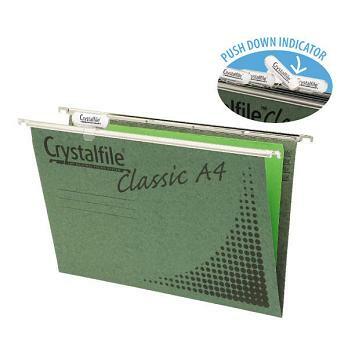 Ideal for those bulky filing jobs – brochures, bound documents, videos, catalogues etc. 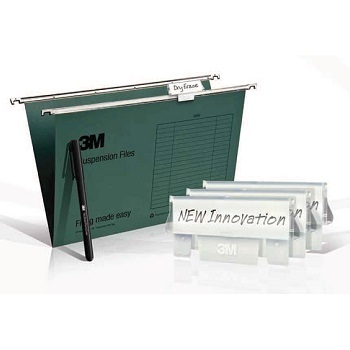 30mm square base holds more than standard suspension files, holds up to 300 sheets of paper. Made from environmentally friendly PP and is 100% recyclable. Box of 10 Foolscap files complete with tabs & inserts. Black. Extra tough, with an extra wide base for frequent use. 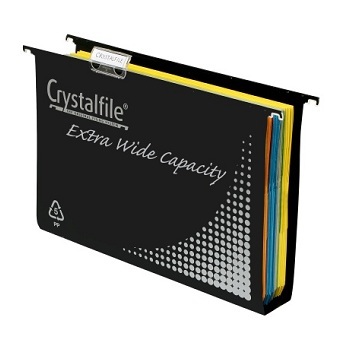 Crystalfile Extra Capacity is made from polypropylene for strength and will not tear for longer lasting, durable files referred to frequently. 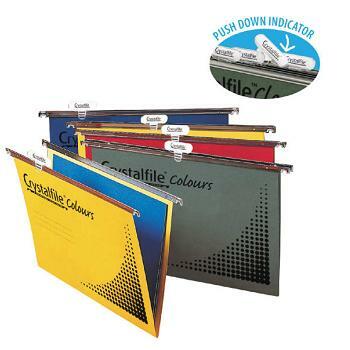 50mm square base holds more than standard suspension files, allowing you to file everything in the one file.